The summer is over and Kurt, Jordan, and Riley have moved on to another job. Kurt's uncle runs a bakery and Kurt and his friends are working for him making deliveries. Every the thinker, Jordan comes up with a plan to make deliveries easier they connect two bikes to an old cart and add a battery powered motor to it with the help of their friend Emmett. Now they can not only get up hills faster, but get away from the boys from school who are determined to bully them. Kurt's uncle hurts his back and so Kurt tries to help out more around the bakery. One of the things he does is spends the night in a room they have for him above the bakery. It makes it easier for him to work later and get up earlier to make deliveries before school. It isn't log before Kurt begins to notice something strange going on. The vacant building across from the bakery has some new occupants that seem to only show up at night and seem to bring in a lot of unusual boxes. At school in history they are learning about currency and counterfeiters. 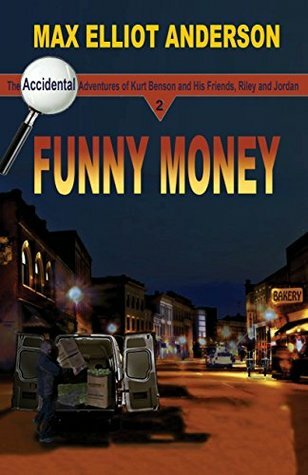 This of course gets Kurt to thinkinng, especially when he learns that several businesses around town have been hit with funny money. 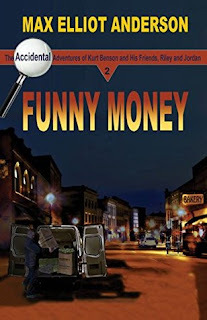 Kurt gets it into his head that there is something strange with the business across the street and he's sure there must be some connection to the funny money. Now all he has to do is convince his friends and come up with a plan. Once again we have a wonderful mystery for kids to involve themselves in.